Home / CM / coalition of the shafted / Common Cause NY / Daily Update / New York / News / Politics / Coalition of the Shafted to State Legislature: "Get It Done"
Coalition of the Shafted to State Legislature: "Get It Done"
NEW YORK, N.Y. -- With just three days left in the current legislative session, over a dozen advocacy organizations from across the state joined together to demand action on issues all New Yorkers deserve: early voting, reproductive health, bail reform, childhood sexual abuse statute of limitations reform and more. In March, the same coalition pushed for these issues in the state budget. Since then, the situation in Albany has only gone downhill. Currently, the legislature is in stalemate, unable to pass bills that are important to all New Yorkers. Lawmakers are elected by the people to conduct the people's business and solve the state's pressing problems -- not engage in political posturing and self-dealings. Activists shared the common concern that when our representative democracy is not strong we all lose. New Yorker's equality, health, rights, education, safety, economic security and well-being should never be up for negotiation. Voters need to be informed how their lawmakers are preforming – or failing to preform – their expected duties. 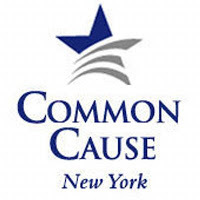 "It will be a failure of our democracy if Albany lawmakers walk away from another legislative session without passing any real voting reform," said Susan Lerner, Executive Director of Common Cause/NY and a core leader of Let NY Vote. "In a year when the Governor, the Assembly and Senate Democrats all agree publicly that we need to pass and fund Early Voting, we shouldn't be pleading at the last minute for reforms 67% of New Yorkers want. Lawmakers need to get early voting and automatic voter registration done in the next three days or face the consequences in the fall." "Speaker Heastie has put fealty to the Governor above the public interest, the will of the Assembly, and his own mind. Even though he supports the policy, he refuses to put to a vote bipartisan anti-corruption bills which overwhelmingly passed the Senate and will make the state's troubled corporate subsidies transparent and accountable. Once again, Albany has shrugged in the face of another corruption scandal," said Alex Camarda, Senior Policy Advisory at Reinvent Albany. "There is no substitute for state action to secure our reproductive health care and rights with a federal administration committed to a public health care agenda based on fallacies, not facts. The health, safety, economic security and equity of New Yorkers rests on our ability to control our own bodies. Every day that passes without our state securing and safeguarding our access to fundamental health care including contraception and safe, legal abortion leaves us all at risk," said Robin Chappelle Golston, President and CEO at Empire State Acts. "We're sad to see that the old Albany anecdote of "Legislators don't pass bills in an election year" proved to be true in 2018. In the last 6 months, 8 public officials have left office after being accused of or found guilty of public corruption. New Yorkers have had enough! We cannot allow another session to end without passing meaningful ethics reforms. After being ignored during the state budget and promised that our issues would be addressed during the second half of session, we have once again been left in the lurch. The people are watching and they will not forget come November," said Jennifer Wilson, Legislative Director of the League of Women Voters. "It is truly a disgrace that New York State can leave 2018, the year marking 50 years since Dr. Martin Luther King's assassination, without any progress or legislation. Civil rights rely on a functioning democracy and it is clear that New York democracy is not working for New Yorkers. We call on all Albany legislators to work together and pass meaningful legislation that actualizes our given rights to a fair criminal justice system, fair elections and equal opportunities in healthcare and employment. These are our civil rights. We will continue to fight for them as Dr. King did 50 years ago," said Rev. Al Sharpton, National Action Network. "Once again, New York lawmakers are facing the end of the legislative session without advancing meaningful reforms that New Yorkers want and need," said Erika Lorshbough, legislative counsel for the New York Civil Liberties Union. "For the last six months, state officials have promised action on criminal justice reforms, protections for reproductive rights, and changes to our antiquated election systems. But with less than 72 hours to go, Albany is still more focused on this year's elections than on moving the people's agenda. As the Trump administration continues to push its regressive efforts, we need legislative action in Albany to move New York forward." "The climate deniers running the New York State Senate appear to have won the day for another legislative session. Despite a bi-partisan vote in the Assembly and a similar support in the Senate for the Climate and Community Protection Act, which commits the state to a 100% renewable energy future, New Yorkers must continue to wait for action on climate change. The failure of Senate leadership delays the opportunity to create thousands of new jobs and protect the health of our communities," said Peter Iwanowicz, Executive Director of Environmental Advocates of New York. "Objective observers looking at the New York State Legislature must conclude that it's members don't care about the public or the government that should be of, by, and for them. What alternative conclusions can one draw from a body that refuses to act on reforms that have overwhelming bipartisan and popular support. While the legislative session ends this week, the reelection campaigns are just beginning and voters must react to inaction," said Betsy Gotbaum, Executive Director of Citizens Union. "The cascade of corruption trials continues, but there are no agreements to address the problem from the governor and the legislature," said Blair Horner, NYPIRG Executive Director. "With the legislative clock ticking down, Governor Cuomo has to weigh in and get agreements on corruption-busting reforms. New Yorkers deserves actions, not the sounds of crickets from Albany." "It's unconscionable that the Assembly Majority refuses to move two needed reform bills that literally passed unanimously in the Senate. With the start of yet another corruption trial one has to wonder what it takes to get some checks and balances put in place in Albany. The Procurement Integrity Act and the Database of Deals need to pass this session. Corruption is not progressive, it's time for the Assembly to move these bills," said Ron Deutsch, Executive Director of the Fiscal Policy Institute. "This new-found advocacy work of mine has shown an ugly & despicable side of our state government that many don't see. While most Senators in the GOP did nothing of substance to advance the rights of child victims of sexual abuse, more of our kids were abused by predators who will continue to roam the countryside. They did this to advance their own agenda and to enrich those close to them. Kids in this state are a distant 3rd. Know this, folks: November is coming. Enjoy your last day of session in the majority," said Jason Gough, survivor of childhood sexual abuse. "Senate Republicans will walk away from session yet again without passing The Child Victims Act: real statute of limitations reform for survivors of childhood of sexual abuse. The Child Victims Fund, Senator Young's bill, is blatant, and brazen attempt to use state money to pay off survivors on behalf of abusive institutions and force the survivor community apart by making us choose between survivors of individuals and survivors of institutions. Survivors of childhood sexual abuse deserve real justice - not a half-baked excuse. If Senate Republicans won't acknowledge that, then they'll face the consequences in November," said Asher Lovy, survivor of childhood sexual abuse. "In an election year, Senator Young's Child Victims Fund is a farce and a smoke screen so Republicans can appear to be doing something for childhood sexual abuse survivors, when in reality it does not protect future victims. One in four girls and one in six boys will be sexually abused - it's time Albany lawmakers care about them and pass the Child Victims Act," said Mary Ellen O'loughlin, survivor of childhood sexual abuse. "New York must take the necessary steps to seal low-level marijuana possession arrests and convictions. For too long, hundreds of thousands of New Yorkers have waited for the Legislature to agree that it was time to repair the harm that has been caused by the widespread misapplication of the law. The Legislature has allowed a loophole in the law to be exploited and for over 800,000 New Yorkers, mostly of color, to be arrested for marijuana possession in public view; saddling them with a criminal record for the rest of their lives that significantly inhibit their access to opportunities. These arrests were largely the product of unjust and unconstitutional stops by police. These arrests and convictions must be sealed and they must be sealed now. New York's most vulnerable populations cannot wait for the next Legislative session," said Christopher Alexander, policy coordinator at the Drug Policy Alliance. "To make progress on economic fairness, healthcare, the environment and racial justice, we've got to make progress on reviving our democracy. All of our issues are connected. The anger and frustration most New Yorkers are feeling about our government and our economy will drive action and accountability one way or another. If lawmakers can't find a way to take action this week, they'll face a wave of small-d democratic fury in the voting booth later this year," said Michael Kink, Executive Director of Strong Economy For All Coalition. "Children, parents and educators are tired of being used has pawns in Albany's quid pro quo culture. The Governor must take the lead to end Albany's political horse trading," said Jasmine Gripper, Legislative Director at the Alliance for Quality Education. "Governor Cuomo needs actually ensure a quality education for all children. This means delinking teacher evaluations from test with no strings attached. It also means working toward ending the school to prison pipeline by passing the Safe and Supportive Schools bill. New Yorkers need Governor Cuomo to step up and lead. He can no longer use the Senate Republicans as an excuse for inaction or watered down compromises. We have a Democratic Assembly, Democratic Governor and the Senate Democrats now hold significant power. The time is now to move New York in the right direction before session comes to an end," said Jasmine Gripper, Legislative Director of Alliance for Quality Education.